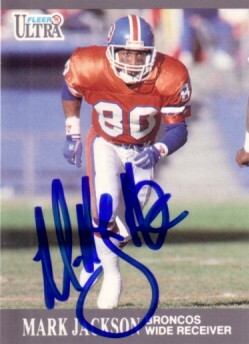 1991 Fleer Ultra card autographed by former Denver Broncos star receiver Mark Jackson, who was one of John Elway's favorite targets during the 1980s. With certificate of authenticity from AutographsForSale.com. ONLY ONE AVAILABLE FOR SALE.